Jonas & Corey will perform a FREE acoustic in-store show at STORE 1850 (Carrefour du Nord) in St. Jerome, QC this Sunday, November 27th at 1 Pm, to promote the new Jonas & The Massive Attraction War Child T-Shirts. The band teamed up with apparel retailer TXT Carbon to design and sell the limited edition T-Shirt, with a portion of all proceeds going to support War Child, an award-winning charity that provides humanitarian assistance to war-affected children and their families in some of the most devastated regions of the world. Just in time for Christmas, the men’s and women’s T-Shirts are available exclusively online in both long and short sleeves at www.txtcarbon.com and www.tvaboutiques.ca as well as select retailer stores nationally. 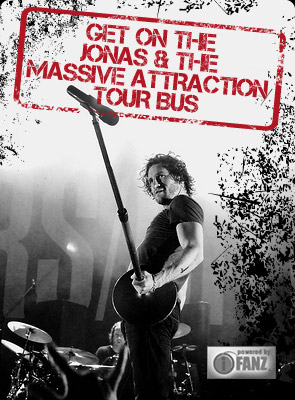 Get your Jonas & The Massive Attraction War Child T-Shirt now and support a very worthy cause!